When deciding on a cherry fruit tree, you have to decide on how big you want your tree. Rootstocks determine the size of you tree with dwarfing rootstocks producing smaller trees. You then have to select a variety, ideally one you like the taste of. 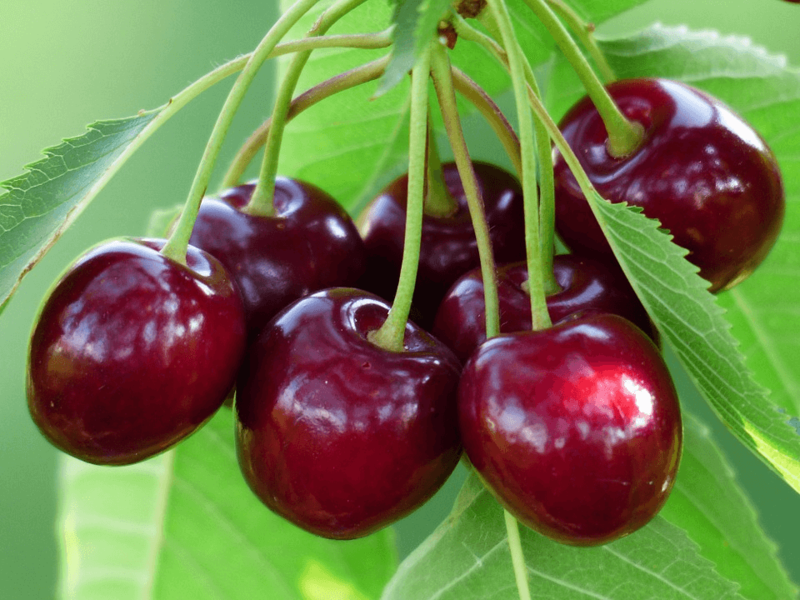 As many will not be familiar with cherry varieties, we have made some recommendations. Unlike other fruit species, it is recommended that you choose a self-fertile variety as your first tree as you can’t be sure of pollination otherwise. Once you have a self-fertile variety in your orchard, you can purchase any cherry in the same or neighbouring flowering group. Cherries are liable to cracking in heavy summer rains. Varieties with a resistance to cracking are recommended as you’ll receive an unblemished crop. Studies have shown that ‘Karina’ and ‘Regina’ exhibit high resistance and ‘Lapins’ moderate resistance. Cooking (acid or sour) and dessert (sweet) cherries are actually different species: cerasus and avium respectively. They can still cross-pollinate, however. Sweet cherries do not keep well and are best eaten fresh. This is why it is important to spread your orchard between early, mid and late cherries. Unsurprisingly, traditional English varieties are actually from Continental Europe. Cherry production didn’t take off in England until the first half of the twentieth century. Modern cherry varieties are primarily from Summerland research, Canada who started a self-fertile cherry program in the 1940s. They introduced the now classic Celeste, Stella, Sweetheart and Sunburst, which all start with an “S”-sound. Cherries are often characterised as black or white, with black referring to the colour of the skin and white referring to the colour of the flesh. White flesh is associated with excellent flavour and common to traditional varieties. Black, or dark, skin is associated with modern varieties, which need be aesthetic. Sometimes you will see cherries labelled Bigarreau, which refers to a firm-fleshed variety. Cherries can be spherical or heart-shaped, although sometimes heart-shaped is broken down further. Lapins (sometimes known as Cherokee) remains the cultivar of choice. It is self-fertile, productive and its fruits are resistant to cracking. Sunburst and Sweetheart make excellent alternatives and will produce bountiful crops of delicious fruit. With cooking cherries, you have a choice of Morello and Nabella. Nabella is the new introduction, although Morello still retains RHS Award of Garden Merit. Both are self-fertile. Look no further than May Duke, a self-fertile cross between acid and sweet cherries. Celeste is the best self-fertile early season cherry. Mid-season, you are spoilt for choice with Lapins, Stardust, Stella, and Sunburst. Late season, there is a choice between Kordia and Sweetheart. Sweetheart has the best flavour. Cherries with the dwarfing Gisela 5 rootstock are recommended for small gardens, which will produce a 3m tall tree. You can always prune your tree to reduce its size. Alternatively, buy a cordon tree, which is trained to produce a columnar shape. Petit Noir, Hartland and Celeste are all naturally compact. Sylvia is as well, but isn’t self-fertile. Napoleon Bigarreau, Stardust Coveu and White Heart are all white cherries. Stardust is unique in that it is self-fertile. All these varieties have exceptional taste. Cherries with the Colt rootstock is recommended for cold areas as Colt produces a tree higher from the ground. Be sure to plant your tree in full sun! Developed in the UK at the John Innes Research Station, Summer Sun makes an excellent choice for colder areas of the UK. Lapins and Sweetheart are exceptionally productive cultivars. It is best to combine these varieties with Colt as Gisela 5 can overbear, leading to poor quality fruit. Next: Does Metal Garden Furniture Rust?